Threespine stickleback (armored), in Toro Creek, San Luis Obispo County, CA, on 30 April 2006. Note: spines are folded back because fish are swimming into the current. Photo by Steve Howard. Threespine stickleback (armored). Location: Sacramento-San Joaquin River Delta. Date: 16 April 2011. Photo by Christopher Mosser, UC Davis. Threespine stickleback (armored), captured in rotary screw trap on Sacramento River at Knight's Landing. Date: 10/19/2009. Photo by Kasie Barnes, California Department of Fish and Game. Note: Measurement scale is in millimetres. Threespine stickleback, unarmored. Captured from San Antonio Creek (Vandenberg Air Force Base) in 2008. Photo by Carl Page, ARS Consulting. 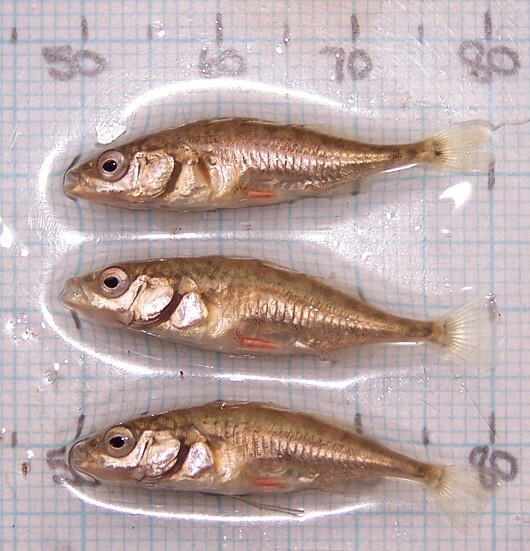 The threespine stickleback has a unique characteristic of developing distinctive forms based upon geography and physical conditions. Several forms may exist within a single stream or drainage. Typically the amount of armor is representative of the predatory threat, and stickleback bodies vary from fully plated to unarmored. 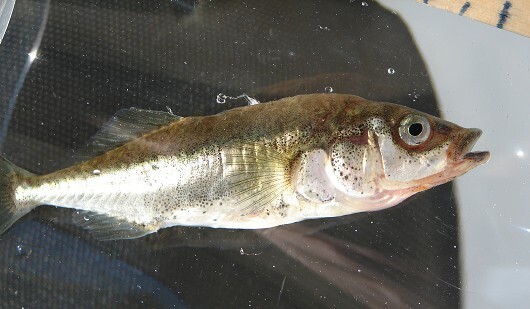 The stickleback may have a resident freshwater or anadromous life history, though this fish is capable of completing its entire life cycle in fresh or saltwater. Within a stream the threespine stickleback prefers shallow slow water along the edge with varying substrates. They prefer areas with adequate cover in the form of aquatic plants or overhanging brush to protect them from predators like birds and piscivorous fish. In addition sticklebacks need clear water for nest building and food foraging. These fish require cool water for long term survival, in the range of 23-24°C. Good salinity tolerance has allowed them to inhabit estuaries or saltwater environments, sometimes living as far as 800 km offshore. 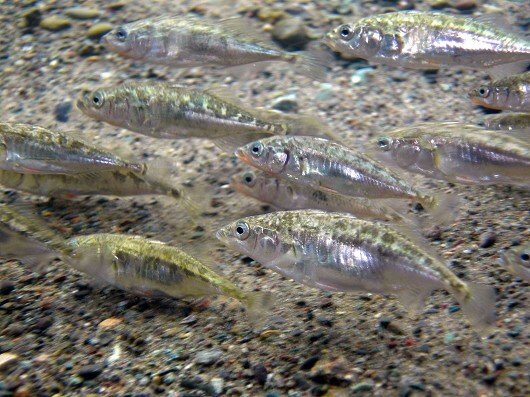 Sticklebacks usually form loose schools or shoals, and individuals as well as groups form specific feeding habits. Freshwater populations feed mostly on organisms living on the bottom or amongst aquatic vegetation, whereas anadromous forms feed more on free-swimming organisms. 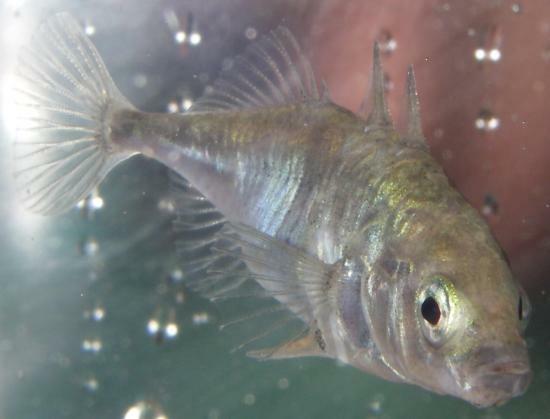 Most sticklebacks complete their life cycle in one year, though it is possible for them to live 2 or 3 years. Breeding occurs in late spring to summer in freshwater. Anadromous forms typically breed earlier in the season after moving up into a stream. The males dig and prepare nests, which may be filled with 50-300 eggs by the females. Each female lays eggs in several nests, which are then covered and guarded by the males for the 6-8 day incubation period. Predation on eggs is not uncommon, and sticklebacks may prey upon other adjacent nests. The fry remain in the nest for several days, and upon emerging are guarded in a shoal by the male. As the fry grow and develop they will eventually leave the male to join a shoal with fish of their own size.